Greg is a second generation Chinese Australian, even though he spent much of his childhood growing up in China. Being of a mixed race background (Scottish Grandparent) and gay means that Greg has a unique view point about the art scene. His considerable education, including post graduate work in the UK, a Master of Arts Degree and a PhD has given him a solid preparation for being a practising artist as far as skills but not so much in regard to being a minority in a minority in Tasmania. He has, however established himself in the arts and has moved on to curating as well as producing art. He is also a very engaging speaker. This show in McClelland Gallery is about two different generations of artists covering those born closer to 1943 and those nearer 1986. The works are from 1979-2012. Sixteen artists are contributing to the show and the works are anything from traditional oil paintings to Chinese style paper cuts to video. The theme is mostly about being Asian in Australia, although topics also cover being an affluent artist in China, gender and sexual orientation issues and political ones. I am not going to go into all the works in the show by all sixteen artists as there is a very good catalogue which can be purchased when you go to McClelland for a very reasonable price. What I will say is that even though a few of the images and videos are confronting there are others that are very beautiful and most are thought provoking. The exhibition catalogue also contains very good examples of artist’s statements for anyone wishing to see some before they write their own. Annika’s web site is a little short on biographical info but below is some of her introduction. Born 1983 / Lives and works in Melbourne. Represented by Nellie Castan Gallery Melbourne and Bett Gallery, Hobart. I have taken a little text written in Annika’s web site for one of her exhibitions to briefly explain her artwork. For the rest please go to her website at http://www.annikakoops.com. I was impressed by Annika’s confidence in presenting her work. She had an air of confidence which in a way defied her age, which I was guessing was in her late twenties. She has exhibited widely and has received several awards and grants. Her mix of multi media, by use of photography, computer software and traditional methods of oil painting is another step in incorporating more “tools” into the production of art. Some may shy away from this, saying that it is not true fine art. If we look into history however, we would see that various methods and tools (technologies) have been used in the past. We can see this in the paintings from the 17th and 18th Centuries which is why a lot of people look left handed. We then go on to the use of the camera and how it enabled artists to really see how various things worked (horses in action for example). Artists have been for and against these for many years, some artists even sway from for to against in their own careers. Whether you like Annika’s work or not, her imaginative use of technology for production of her artworks is interesting and something to think about. We should not dismiss any method as not for us, because in the future we may just change our minds. Admittedly, her style is not one that attracts me too much. The solitude of her subjects and the emptiness of her created spaces have a sense of sadness and melancholy for me. Whilst appreciating the skill to produce them, I have trouble connecting with them on any deep emotional level. I liked her glazing technique, which is reminiscent of the paintings from as early as da Vinci but the mix between realist and the “plastic” veneer of avatars from computer games is not really for me. Then again I don’t play computer games like World of Warcraft etc and don’t tend to look at them for artistic content. The works that looked a little like scratchboard works were interesting. They were in fact oil paintings of a sort but the modelling with lines into a dark background looked more traditional and more like drawing and painting techniques that I could relate to. The works installed in Bristol with light streaming through loads of little holes in a dark canvas or board were quite striking and innovative. Whilst keeping the designs simple, to make sure it would fit the ornate architecture around them, interesting patterns were created. We had a brief follow up session after the presentation. It was said that whether or not you like the visiting artist’s work, seeing and listening to others’ approach to their art will help us form opinions about our own style, direction etc. How has the artist’s work informed my own work and sensibility? IE: How have my ideas about my work and the world changed? I don’t think it has. I have a good idea of the general direction I wish to go in. It is not the same as hers. I took note of her work ethics which are not that dissimilar to mine. How has this artist’s work informed my view of society and culture? I have worked with computers since 1988. I have seen it change the printing industry, advertising and the way we bank, play, shop and socialise. I have also noticed that as we mature we tend to look for more “personal interaction” and our interests and priorities change even with computers all over the place. They are becoming just another part of life, and I think will soon seamlessly blend into our daily activities. The distancing of some to solitary lives with just a screen in front of them is an extension of the world becoming disconnected in one way and connected in another. Some would see it as people who would not normally reach out doing so with the aid of the web for instance, others would say that it is the cause of people becoming isolated. Computers and the web for me are aids to an end. Another means to advertise, promote, network with artists all over the world I wouldn’t normally get to meet and get feedback about my art. It also allows me to keep in touch with some who are a distance away and learn. Seeing technology today being used as further aids to creative productivity isn’t new, just the methods are. I don’t know that Annika brought any new views to my thinking, she may have just confirmed that others had similar thoughts. 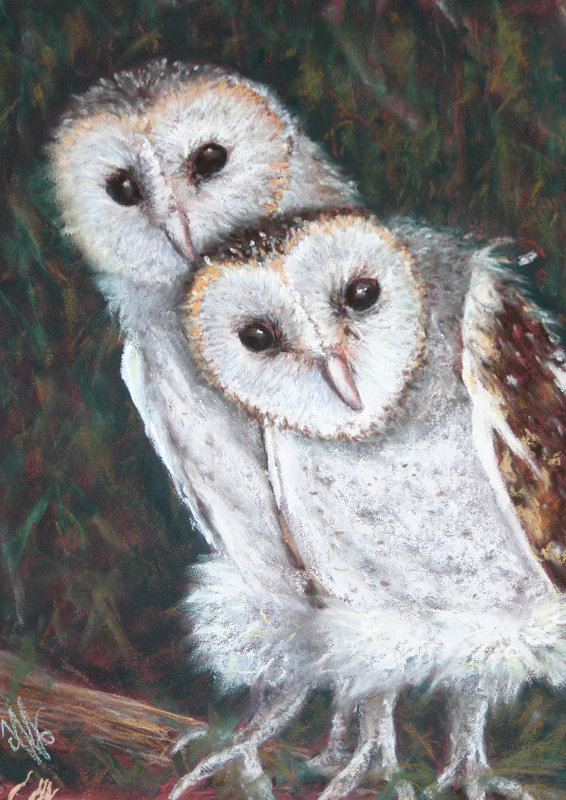 This is my latest pastel painting of barn owls, a commission for an existing client and a job I also enjoyed doing. The pastel artwork was inspired by a recent visit to Healsville Sanctuary. I spent the afternoon at the sanctuary photographing lots of animals, but I went there mostly for the birds. It isn’t often you get very close to eagles and other birds of prey or to some of the colourful lorikeets and galahs we have in Australia, let alone the tawny frogmouths and owls which are nocturnal. These birds are youngsters, which is why they have the lovely fluffy bits over their legs. 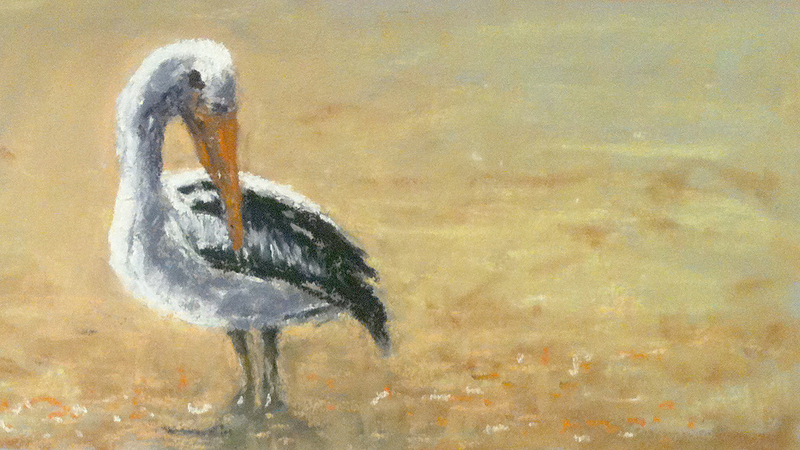 As I have been working on birds a fair bit during the past year or so this pastel painting was easier than earlier works of three to four years ago. The spots and variations in the colours through the faces and the lovely expression in the eyes made this a very enjoyable painting to do and the character of the birds is quite strong making it interesting for the viewer – especially if you love owls. Whenever I start an artwork now, I try to remember what several established artists have said “it is only paper and pastel”. It takes away the pressure you can tend to put yourself under so that the process is far more relaxed. The faces came out as I expected and I love the colours through the whole thing. I was in such a great relaxed mood when I did the piece and it shows so well in the feel of the final painting and the expression in the owl’s faces – even in my mark making on the paper, I feel. As this work is a commissioned artwork and already sold, I am happy that it was completed in a timely manner and the client has approved it. Another sale and happy artist! 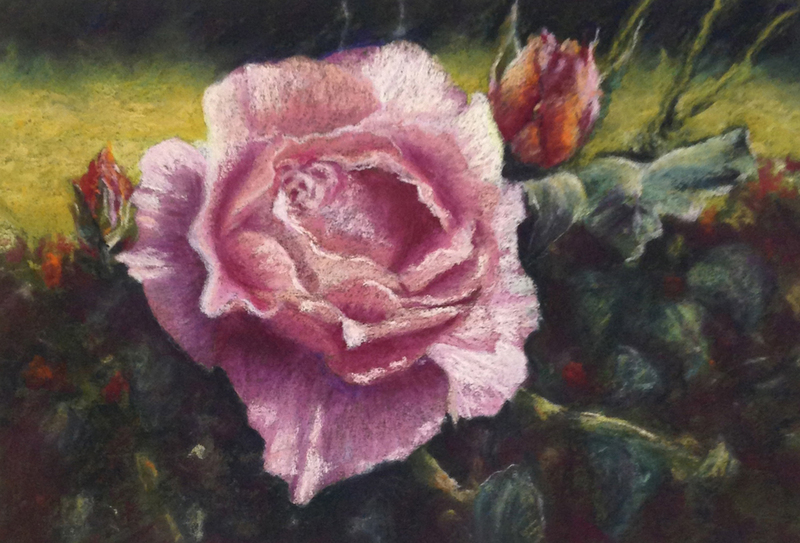 Pastel painting on Tex pastel paper derived from photos taken at the rose gardens in front of the Mornington Peninsula Regional Gallery (MPRG) on the Mornington Peninsula, Victoria, Australia. A lot of little details have been deleted and the colours have been modified to suite. The background has been simplified and darkened so that your attention is only on the large rose and its few rosebud companions. I am still practicing painting and drawing flowers, roses in particular, which are a popular subject for art collectors and many people like to see paintings of them in their homes. They are a favourite flower of mine as well and I have always admired people who could do these flowers justice. During the past year I have been lucky to study with a few excellent artists who have given me some tips on how to approach subjects like roses and not get lost in the maze of patterns going on as well as simplifying subject so that the viewer fill in the gaps as they look at it. I owe them a great debt of gratitude, because without their input this painting would never have happened. The goal is to create an artwork, not a painting that looks like a photo. There should be a natural flow as you work your way around this artwork which took a bit of thinking and planning, as I am working on making the composition mine and not a random pattern. As paintings go I am happy with achievements I have made in it, but at the same time I am looking forward to improving even more in the future. The comments it has received and the award at Berwick Art Society have shown that it is painting that will attract positive feedback and that many people like it. That is something that I am always happy to hear and hope that as I improve they will keep coming! it also sold just after I posted it on social media for feedback – you can’t ask for much better than that. This year the art camp for Chisholm was held even closer to my home than last year which meant that I was able to drive to the site each day. The camp is a three day event held for Visual Art, Advanced Product Development (visual art) and Illustration students. Workshops are held by the tutors during the day and everyone is encouraged to try their hand at new materials and methods. For those of us with cameras, it is also an opportunity to take reference photos for later works, or just enjoy the process of photography as it’s own art form. For me with camera in hand it was a chance to do both. Arriving early each day I was able to get time to photograph for an hour or so, then get stuck into painting on site from nature for a change, then go back to photography later in the day. Over the three days this has meant over three hundred photos have now been imported into iPhoto for future use and the completion of two water colours, three pastels, three acrylics which have now been over painted with oils and two oil paintings. I also visited Shoreham, Balnarring, Flinders, and Somers beaches as well as the Somers Mansion and wetlands for photography. I met some great locals who showed me spots to paint along the shoreline at Crib Point and mixed with some of the students whilst we looked and each other’s work. The break away has also for me, meant that I can get some ideas going for sculpture this year. It is interesting that when you are free to let the mind wander a bit, ideas can come flowing for creative projects. My thanks to the organisers of yet another enjoyable camp. Fun, educational and relaxing (productive too I might add!). It will be interesting to see all the results at the Bright Space Gallery this year. 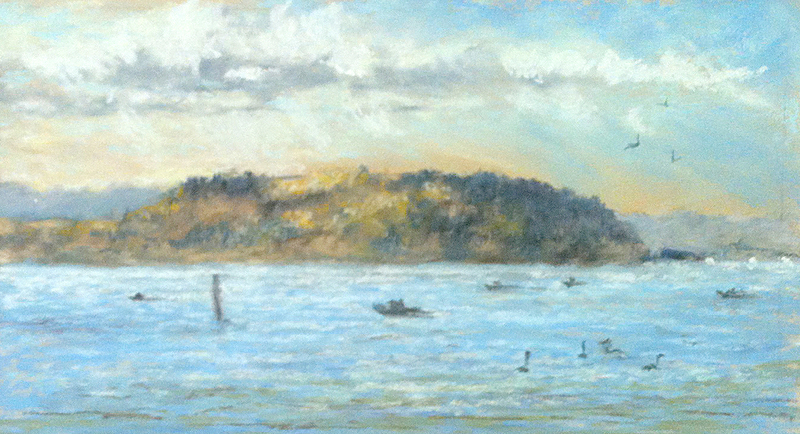 The second demonstration for 2013 at the March meeting for the PSVA, was supposed to have Herman Pekel demonstrating water colours. A bit strange for a pastel society to have so many artists showing other mediums but, hey, I use most of them so I will go if I want to learn something new! After the forty minute mark past the start time of the demonstration we finally gave up on Herman and Regina very kindly stepped up to do an unplanned demo of tonal portraiture in tones of grey and black. The colours (or lack of them) was because she didn’t have her kit with her and the pastels were donated, as was the paper and easel. The sitter was a volunteer from the attendees. I have to say that Regina has gained my admiration for doing such a great job without any warning and with none of her own materials. As we know most of us get used to using all our own pastels etc. They become familiar and the application to the paper is known before we use them. To pick up any new pastel in front of a crowd of experienced pastel artists was what I consider to be rather brave and shows her considerable talent, experience and comfort with her own abilities and training. Regina talked us through the measuring of the head and having a set point to return to as you build up your portrait, to not only continue measuring from, but also to check the progress of the work without hovering too close to it. From a few light marks to show the division of the head into thirds the shadows were drawn in and the lines to mark the nose and mouth were placed. As Regina is a tonalist she shaded in all the area of the dark side of the face and under the brow including where the eye was to go. The light application of the pastel allows for a lot of layering so the lighter shades could go in later to show the whites of the eye on that side and lighter parts of the eyelid. The space between the eyes was measured carefully, using the method of the width of an eye being between each eye on a face. This is a general rule as everyone is a bit different but gives you a great starting point. A mirror from a compact was donated for use to check the progress of the work, which seemed to work very well. It’s amazing what you can work with in a pinch, and the portrait was still looking amazing as the tones were built up to form the modelling of the cheek bones, chin and nose. The eyes were worked on fairly early in the piece as Regina likes to work from these outwards. This is a method I use for painting animal portraits. As soon as I can see the character of the animal the rest just seems to flow on naturally. Regina called this the “Daniel Green Method”. Another method I saw her use was placing a touch of her lightest tone on the nose so that she could see how it sat with all the other tones already used. This made it easy to see how much room she had to broaden her tonal values. You need three values to create form and addition of more in between these models things like faces. Good contrast in tonal values also creates drama and depth pushing and pulling things forward and back into the painting. “Remember the little shadow under the eyelids”, was a good point. These little touches make yes look realistic and help the eyelids to look like they are over the eye and not part of it. As she worked her way around the portrait, Regina commented that even with so called recipes on building up images, you should still just go with the flow. If that takes you away from one part to another then just go with it. Working naturally for yourself and your painting style is better than struggling to try to copy someone else’s. Draw over things if you are not happy with them, brush off bits if that doesn’t work – the pastels can handle it. 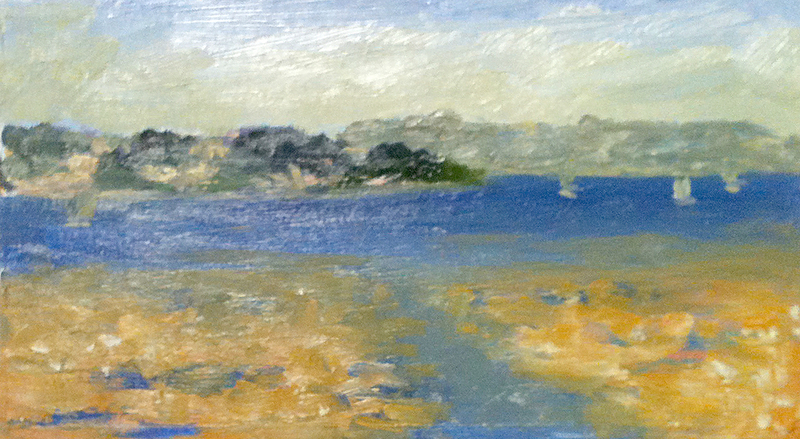 Building up with soft application of layers allows alterations and changes. The model had lovely long dark hair which framed her face very nicely so when this was drawn in it pushed the face forward and it became even more three dimensional. With very small adjustments here and there to soften some edges, add a little highlight here and there the portrait was completed. Regina said she probably do more to it, but it looked beautiful the way it was. Great mark making with a painterly finish that still held up as a very nice likeness to the model. The best bit was seeing how a well trained artist can rise to the occasion and produce some amazing art under conditions that many of us would shy away from. I am actually happy that Herman didn’t make it on the night, I really enjoyed watching Regina work and learnt a lot from seeing how you can rise to a challenge – even in front of a crowd, at the last minute! Barbara’s human studies, especially her life drawings are stunning. It is worth your time to go to the Vic Arts web site to view her work. She has recently had a very successful exhibition at Vic Arts with over ten sales. In a depressed art market, especially for the lower and middle price ranges, like we have had for the past couple of years, this is a very nice result. The top end seems to always hold up – especially if you’re dead it seems, but as most of us are not in that position – thankfully the dead bit – we have to try to make sales and survive. I am veering off topic a bit so back to the demonstration today which was about putting people into your work, and as Barbara is an established pastel artist, that is the medium she chose. It is also a great medium for a demo as you don’t have to worry about solvents, spills and carrying wet paintings around after you are done. We had the pleasure of watching Barbara get two pieces done today. She is a very efficient artist and is able to get her blocking in done on the smaller sheets of pastel paper with beautiful light sweeping layers of pastel pigment. Rather than drawing in the shapes or composition, Barbara starts with a blocking in technique which gradually fill in the page with light layers of the darker tones. As she cuts in and lays down shadow areas the general shape of the subject is created. This method being very good for being able to adjust as you go and not force you into anything too early. The layering of broad sweeps of colour over the top of each other also gives a lovely depth to the work as it is gradually built up. Contrary to many other artists who for some reason avoid black all together, Barbara said not to be afraid of it. It is in many of the darker pastels anyway so a careful use of it can help in creating a dynamic tonal range and very interesting mark making. By working all over the artwork and keeping it at the same level of completion, as other artists have recommended, you don’t get ahead of yourself and it helps in creating a painting that has a uniformity about it. The colour you use in one area can be introduced to others to pull it all together and give a colour theme. the use of lighter tones of the same dark colour used over the top instead of white also helps in creating a unified look. If you want to create drama, try a lighter warm tone on top and scumble it onto some other areas as well. The white can be left for minimal final touches where it will really make the work pop off the surface of the page. Another important point here was if you decide that something isn’t the right shape or size, pastel can be brushed right off the page and you can start again. The method of laying in light layers allows for alteration and deletion of areas at nearly any time making pastels a very versatile medium. Other than that the technique of starting large and broad with your darks and gradually going more detailed and lighter is not that different to oil painting, so any oil painters would be fairly at home with having a go at pastel painting and drawing. With only 40 minutes after the coffee break Barbara took on the challenge of producing another artwork. I personally think that this second one with its lovely loose mark making was the best out of the two for the day. The general shape was blocked in very quickly and the lights and darks were made lively and with some beautiful results. A bit like challenging yourself with doing some “speed sketching” the essence and overall look of your topic has to be drawn in and a focal point worked out and dynamic blocking in with high contrasting complimentary colours achieves this. All this is pulled together with the underpainting of colours spread over the work and use of your high key colours over the top. The emphasis on the focal points in these two works and keeping the other areas nice and soft and loose made two pieces that drew your attention in and directed you around to investigate the rest, with the clever use of the colours and softening at the bottom stopping the subject from looking like they were sliding out of the bottom of the page. Of course when doing any artwork, especially a demo, the final lesson is, knowing when to stop. Not only when your time runs out, but also when any new marks do not add anything to what you are creating. If it doesn’t add anything important – don’t do it. I always like watching Barbara paint. Her various marks and wide range of applying the pastels is something important to learn for my own pastel artworks. She is a very generous lady and talented artist and we were lucky to be able to watch her at work. Quoting the web: Louise Joséphine Bourgeois, was a renowned French-American artist and sculptor, best known for her contributions to both modern and contemporary art, and for her spider structures, titled Maman, which resulted in her being nicknamed the Spiderwoman. I do admire a person whether male or female that can produce work to a week before their death. That passion to be creative all your life is a wonderful and inspirational thing. With these things in mind I went along to HEIDE today to see all the work on display, as I have never been there before. Lack of funds for travel, no car to trust the drive to or before that long work hours have prevented me from following up on wishes to explore such places. That is the advantage of going back to study. The opportunity to finally get around to it with the kind support and encouragement of my husband who can now afford to help me to follow my dreams. OK back to the art. I really did look at the pieces and tried to understand how they were created and thought about any impact they may have had on me. I can honestly say that I had no connection on an emotional level and the style was not to my taste at all. The more I look at contemporary paintings, sculptures and prints, the more I can honestly say that they really are not my “cup of tea”. Occasionally I will see lovely colour in one, or good texture in the paint, but on the whole, they do not interest me for long. I can see some technique as far as skill in building, stitching or finishing in some pieces but the composition and subjects didn’t hold me in front of them for long. I admire Liouse for her long career, for her studies and for pursuing what she wanted to do in life. I just am not keen on her work. I followed up by looking at Caleb Shea whose work I would have liked to see outside rather than on a floor. I think his bright symbols would look great at McClelland park on the lawn. 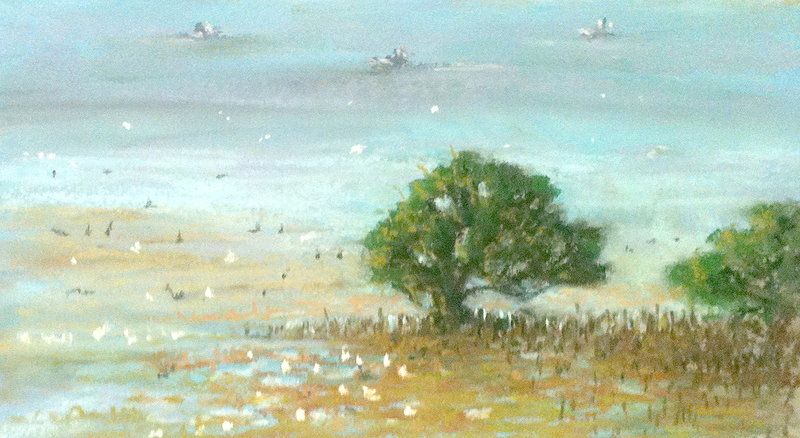 I then had a look at Albert Tucker and decided that my impression of his work over thirty years ago is still the same. Not really for me. I actually enjoyed the library in HEIDE as they had a huge selection of old books which I also like to collect when money allows (and also to read). I liked looking at the old buildings and the gardens and trees. The setting for me was more attractive than the art (sorry but it’s true). The artists who were able to work and live here supported by the Reeds were lucky to have patronage that helped them to produce their artworks, it would have been a great place to produce art, no matter what sort. As we finished up fairly early I decided after a chat with a fellow student to go on to Monsalvat. Yet another place I had always wanted to get to but had failed because of the earlier stated reasons. I have to say that it is a stunning place to visit. I started feeling the creative juices coming out of every pore as I wandered around the grounds. The buildings are beautiful, the gardens and trees very nice and the atmosphere of tranquility and being away from the rush of modern life comes over you as you go in the gate. I had a good time guessing where the building materials may have come from, with things looking like railway sleepers, poles from piers, bricks, carved sandstone and other materials, and windows etc from buildings originally in the CBD in Melbourne as they were replaced by modern office blocks. They all seemed to fit seamlessly into the site. I had a look at the paintings on show by Justus Jorgensen and saw a lot of experimenting with various styles. It seems he was a student of Max Meldrum whose techniques are followed by many artists today. I also had a good look at David Moore’s paintings which I liked as well. His clean colour and sometimes interesting paintings of very simple objects done with simple quick brushstrokes caught my attention. I got a lot more out of looking at these than the works at HEIDE, even if some looked to me, a little “unprofessional or unfinished” in the case of Justus Jorgensen, or like works in progress. The story of Justus Jorgensen and his journey in the creation of Monsalvat by the way, is a good read and well worth it. I enjoyed looking at the variety of works around the building as well as feeling like I was walking through something from 600 years ago. It was a tranquil experience. I sat in the chapel and looked at the religious art on the walls, walked around and checked out the artist in residence facilities which in same cases looked like they could use a bit of maintenance to be honest. Many were not open and I couldn’t see in the windows to see if work was in progress. It seemed a bit odd as I was itching to sit down on the lawn or somewhere and start painting or drawing, the place just brought that out in me. Before leaving I did some shameless self promoting and asked about the artist in residence programs. They have the opportunity for a six week residency for artists to apply for in a couple of very nice spots on the grounds, which sounds quite attractive as a future project, even given the distance from Pearcedale! The exposure at such a highly regarded venue would be more than worth it. I left my business card and it was suggested that I email my interest to them when I am ready… well you never know! I don’t always like the type of art we go off to see. I try to glean what I can from it. What did I like, what didn’t I like, why did I have these reactions, was there any real connection at all? I also if time permits, try to add more to the day if there is something nearby that I have wanted to get to. Today was like that. I got ideas and learned from a few areas, confirmed my ideas about others and followed up on other interests related to but not directly “arty”. I also talked about my own arts practice and direction – and people were interested and I felt confident which was wonderful for me. Then I got a few ideas for future directions which I may or may not take up, but at least it gives options that were not there before. All in all a good day out – again! Thanks Jon and everyone!